This is THE BIG NEWS of the year! Dave Graham has finally taken the sasquatch that has eluded him the past few years in Idaho. Dave is Dale's step-brother, twice removed, on his mother's side - see video. After a somewhat disappointing 2009 season, we're sooooo excited to have another sasquatch success in 2010. Dave got his sasquatch just south east of Burley, Idaho. This 2010 sasquatch was measured head to toe at 7 foot, 8 inches so it was not a record, but darn close. As previous successful hunters, Dave sold most of the meat for Sasquatch Jerky but he signed a non-disclosure and can't tell us the going rate for sasquatch. We presume it is much higher than the $150/lb from 2008. Following on 2 years of adrenalin and testosterone fueled seasons, the 2011 sasquatch hunting season looks to be a record breaker. Conservation stamps and licenses are difficult to keep available and the quota will most likely be met by March 31. The winter season was suspended this year due to the unfortunate tragedy in Montana. The snow melt and warmer temperatures should help in 2011. To reduce costs and make enforcement easier, the same national sasquatch hunting stamp will be used again in 2011. Look for a new contest for the 2012 season. Quickly realizing their mistake, eastern states have jumped on the sasquatch bandwagon, adopting hunting seasons in as unlikely a place as Rhode Island. Very few actual hunters are expected east of the Mississsippi, but states are loath to miss out on the extra revenue generated by expectant hunters. 2011 will be the first year for all 50 states to offer a sasquatch hunting season. We see this as a great success for all the hard work of the American Sasquatch Society. In big sasquatch news, Frank Samuels has taken the first sasquatch as part of the national hunt program. The animal weighed 720 pounds and was taken in the Gifford Pinchot National Forest north east of Takhlakh Lake by Mt. Adams. Mr. Samuels sold 275 pounds of sasquatch meat to Jerky.com through their new Sasquatch Suppliers program for processing into their new line of Sasquatch Jerky. Mr. Samuels was reportedly paid $150/lb for the game. This sasquatch photo was taken just before his shot. Eager hunters have rushed to purchase the first available sasquatch hunting and conservation stamps in anticipation of the season opener in January, 2009 after increased sasquatch sightings in 2008. Some licensing stations were sold out and many hunters voiced concerns over the lack of coordination between national and state agencies. The winning entry for the national sasquatch hunting stamp has been chosen. 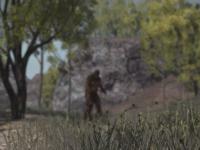 From over 350 submissions, the final choice features sasquatch in motion. Moving quickly to make a 2009 season a reality, latest sasquatch news finds that legislators pushed through the national hunt referendum, passing by only 3 votes on July 13. Seven western states had already proposed seasons, waiting for the national decision. The first season is scheduled to open in January, 2009.